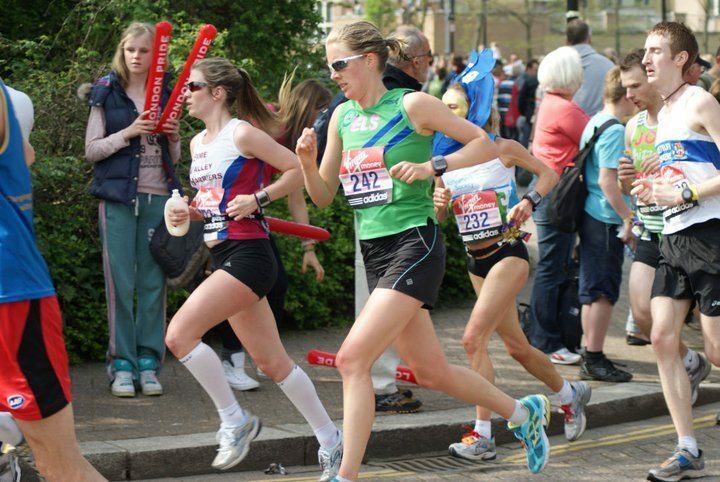 It can be very daunting – it is very daunting – 26.2 miles is a LONG way to run….but if you train for it in a SMART (Specific, Measurable, Achievable, Realistic & Timed) fashion you should enjoy the process and the outcome! I’ve set myself a goal of training for a marathon this year – none other than London Marathon, and have set myself quite a lofty goal of completing the event on Sunday 22 April in under 3 hours. 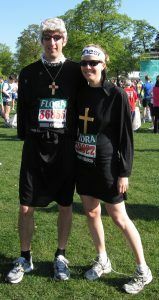 I have run 7 marathons to date (one in fancy dress!!). The quickest Marathon I have run was Amsterdam Marathon in 2009 in a time of 3hrs7minutes; this was way-before we had three children in our lives and lots of other commitments to juggle! BUT BELIEVE TO ACHIEVE! 1. Yasso 800m – Developed by Bert Yasso as part of a marathon training plan it is designed to recreate your target marathon pace on the track in 800m efforts. The intention is to try and complete every (10 in total!) Yasso at your intended pace so if you are heading for a 4 hour marathon you need to complete each lap in 2 minutes and therefore each 800m in 4 minutes. Aiming for consistent times for each 800m with 1 minute rest between each effort. I did this session last night (10 January) with Bracknell Forest Runners and maintained between 2.51 (my last rep!) and 2.54 throughout the session. So in theory this should relate to a 2.51-2.54 marathon time. HOWEVER, there needs to serioulsy be some more miles under my belt before this is likely to become reality. This session isn’t an indicator of your total marathon fitness – it is one part of the ingredients for the mix, but with 14 weeks to go until London Marathon and consistent varied training anything is possible . I will be doing this session again before I taper, reduce my training volume 2-3 weeks prior to London Marathon, to give me a gauge of where my fitness is what my likely marathon finish time may be! 2. Doing a Sunday morning long run (60-90 seconds/mile slower than my target marathon pace) with my clubmates – these runs really are the “bread and butter” of marathon training, and by doing them with others it makes the miles tick away so much quicker than going solo. 3. “Racing” a 20 mile event in the lead up – this sounds nuts doesn’t it? How can you possibly “race” 20 miles? But the marathon is a 26.2 mile RACE…. By doing 1 or 2 competitive 20 mile events in the lead-up will really help you practice your pacing, nutrition plan and will give you realistic feedback as to how your training is really going! 4. Not running – doing something other than running, such as cycling, swimming or aqua-jogging is all refered to as “cross-training” and really does have great benefits. You are still increasing your heart rate but without impact through your feet/legs. My biggest piece of advice is to have a plan (an ideal world plan) which reflects your lifestyle and training budget (time available to train). Any advice or help you want with your training – please just ask.